The purpose of the Troy School District is to ensure learning for all members of the school community. The Troy School District will become an exemplary learning community that supports innovation and is committed to continuous improvement. The Troy School District will be a place where a collaborative community develops curriculum, instructional strategies, and assessment to ensure all students learn. Create a collaborative culture that ensures all students learn. A community of trust, mutual respect, empathy. Implement a relevant and rigorous curriculum. Innovative programs developed from current research and instructional trends. Continuously research, create, evaluate, and adapt best practice instructional strategies to ensure learning for all students. Use ongoing assessments as instruments to design and adapt instruction that ensures quality learning. Design formative and summative assessments based on current research. Literacy: All students will be on track to be college/career ready in literacy. Mathematics: All students will be on track to be college/career ready in mathematics. Science: All students will be on track to be college/career ready in science. Social Studies: All students will be on track to be college/career ready in social studies. 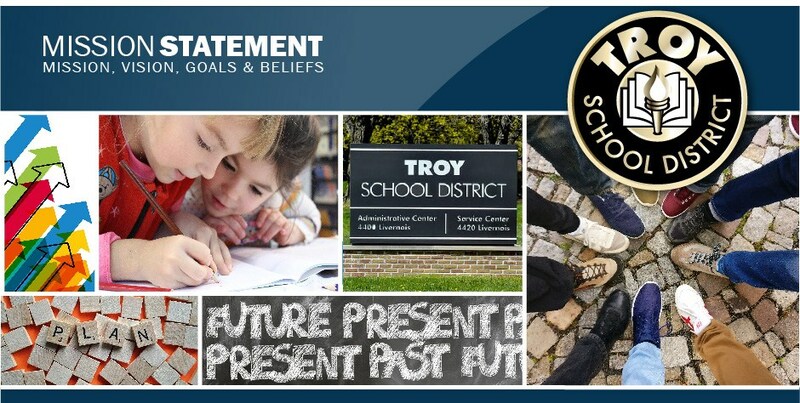 The Troy School District is committed to excellence. The Troy School district is a key element in the community and has a responsibility to be a resource for enhancing the quality of life for all citizens. The educational process is a partnership with the entire community including family, business, and community organizations. The educational programs will provide each student the best opportunity to learn, to develop personally and to experience success. Public education is fundamental to the preservation and advancement of freedom, democracy, and an effective free enterprise system. Positive self-concept and respect for others is fundamental to teaching and learning. The educational process will allow for the unique qualities of each individual.